Does the furniture convert into additional sleeping with ease? Is the overhead cab bed actually useable for sleeping? Are the refrigerator and freezer large enough? Is there ample outside storage? How many A/C units are there and are they ducted throughout the rig? If not, they may not cool the entire unit. Are the water tanks sufficient for your type and length of camping? Is there room on the roof to add solar? Is the bathroom large enough? Can you stand in the shower? Do you need a generator or does the RV come with one? What are your towing limits? Do the cabinets feel cheap? Are the slide outs easy to use? What is the warranty and if you are buying used, do you qualify for an extended warranty? Are the entertainment unit and the TV in a good position for viewing? How easy is the RV to maneuver? 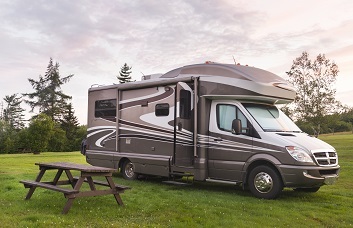 Owning a Class C motorhome can change your life, but like all RV's, you will need great insurance. RVInsurance.com can find you the best rate and the most comprehensive coverage. Call us today at 1-866-646-1755 for a complimentary quote.